Second Life, the wildly popular 3-D virtual world website with over 347,000 residents (and counting), is attracting corporations as well as people. 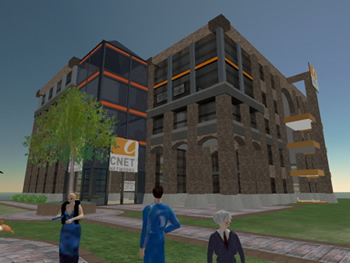 CNet News is the latest corporation to open a permanent presence in this virtual world; their "building" is modeled after their San Francisco office. 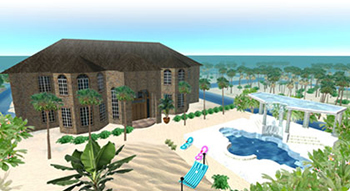 Second Life started in 2003 with just 64 "acres;" it now measures 20,000 acres in size and is growing rapidly. The SecondLife.com website presents a virtual world that is similar to those found in computer games. In this game, however, you can participate in person. People join the site and create an avatar, a digital representation - a picture - of themselves; an avatar doesn't necessarily look like the real person. If you need help, businesses exist in Second Life that will help you with clothing or other unique looks. These businesses, which are run by other participants in the game, can provide you with whatever you need in the metaverse - Second Life has a fully functional economy based on Linden dollars. How much is that in real money? The Second Life economy supports millions of US dollars in transactions every month. Fans of Vernor Vinge will remember his earlier story True Names, which also lays out the basic idea of entering a virtual world using a Portal. The Church of Fools, an experiment in online, interactive worship, will open its virtual doors. The service will be lead by real priests or pastors who appear as "avatars." The Church of Fools' Reverend Jem Clines turned to face the sanctuary wall and disappeared, leaving virtual parishioners thinking about The Rapture. Products provide functionality similar to the CIC Earth software in Neal Stephenson's Snow Crash. Check out Second Life online; CNet's new building was reported here. Special thanks to Jonathan Bearce who provided the tip on the story (and helpful quotes).